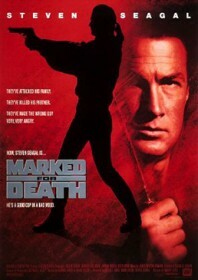 Not one of Seagal‘s better titles, although this one arrives at the violent height of his popularity. A Colombian drug bust goes awry when the cartel get wise to the undercover cops in their midst. The DEA’s finest, John Hatcher (Seagal plus ponytail), loses his partner when he’s shot by a stripper, so Hatcher turns in his badge as soon as he returns to Chicago. “I have become what I most despise,” he tells his priest, determined to live a quieter life with his nieces and nephews. About ten minutes later, a posse of Rastafarian drug dealers start pushing contraband onto high school kids and shooting up seedy pool bars. The film initially paints Rastafarianism in quite broad strokes as something quite dangerous and subversive, personified by the gang leader Screwface (grossly overacted by Basil Wallace), who is a green-eyed black magic weirdo with a penchant for bad art, candlelight and sacrificial voodoo hoodoo. Bongos start playing in the background whenever he’s on screen, which goes some way to understanding the sort of level the filmmakers are going for here. The movie then attempts to rectify its own xenophobia by jetting off to Kingstown and filming some local colour. But despite the great reggae on the soundtrack, the resulting B-roll is still unconvincing. A stray bullet puts Hatcher’s niece in a hospital, so he reunites with his old cop buddy to break a few heads. The Feds display a grudging respect for Hatcher’s wanton destruction and turn a blind eye, despite the fact he’s not even a cop anymore. He also shows very little remorse for someone supposedly seeking redemption for his previous crimes. It’s dumb, cliched and sexist, but there is still a certain magic in watching Seagal trounce a number of thugs with his bare hands, sending guys to the ground with great aplomb. Luckily, there’s plenty of violence on display here, so at least that’s something.